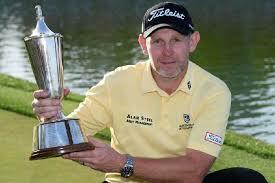 Stephen Gallacher birdied three of his last four holes to produce a stunning comeback and win, by one stroke, his first European Tour title in five years at the Hero Indian Open. His 18-year-old son Jack caddied well for his father. The 44-year-old West Lothian-born Scot, nephew of another Ryder Cup player, Bernard Gallacher, had shared the first-round lead but a second-round 74 saw him slip back and his chances looked doomed when he made a quadruple bogey 8 on the seventh hole in Sunday's final round. The 2014 Ryder Cup star knows a thing or two about performing under pressure, however, and he took advantage of the par five before hitting stunning approaches into the 17th and last to claim his first win since the second of back to back Omega Dubai Desert Classic titles in 2014. A closing 71 moved the 44-year-old to nine under and gave him a one shot win over Japan's Masahiro Kawamura, with Spaniard Jorge Campillo a further shot back. American Julian Suri had led by three after 12 holes but produced a quadruple bogey of his own on the treacherous 14th to slip back, and he finished alongside South African Christiaan Bezuidenhout at six under. On Mother's Day back in his native Scotland, it was a father and son show in New Delhi, with son Jack caddying for Gallacher this season. "It was great to have him on the bag and Mother's Day as well makes it even more special," said Gallacher. "When you're 44 you're in the sort of twilight so it's a big win for me. It was good to finish it out the way I did it, three under for the last four is a great way to finish." He added: "I was pretty calm after that hole (the seventh), there's nothing really much you can do. To see that I was only five back gave me a wee bit of encouragement. "I thought, 'just hang in there'. When I birdied 15 I saw that Julian Suri had come back and then when I got to the 16th green I was tied for the lead. I just tried to finish as strong as I could and I did that. Thankfully it was enough." Gallacher birdied the first but gave the shot back on the third and when he had to go back to the tee twice at the seventh, his chances looked to have gone. Overnight leader Suri made a slow start with bogeys on the third, sixth and seventh but he got on the green at the eighth in two and played a lovely chip off the bank at the driveable ninth to lead by two at the turn. Kawamura birdied the fourth but bogeys on the first, fifth and sixth meant he turned in 38 before a beautiful up and down from the sand on the 11th brought a birdie. A bogey on the next from the 25-year-old handed Suri a three-shot lead and it should have been four when the leader drove the par four 13th but a three-putt stalled the American's momentum. He twice played over the green and then three-putted from the fringe on the 14th and all of a sudden, the contest was wide open. Gallacher made birdies on the ninth, tenth and 12th but three putted the 14th before Campillo was the man to set the target at seven under. He turned in 35 with two birdies and a bogey and then added further gains on the 12th, 13th, 15th and 17th for a 67. A 12 foot putt on the 15th edged Gallacher alongside Campillo and when he hit a stunning approach to six feet on the 17th, he was the man to catch. at the par five last for a closing birdie, and became the second player this season to win with an eight on the card over the week after Kurt Kitayama at the Oman Open. Bezuidenhout made six birdies and two bogeys in a 68 that handed him a third top ten in four events and he finished three shots off the lead, one ahead of fellow South Africans George Coetzee and Erik van Rooyen, Spaniard Nacho Elvira and England's Callum Shinkwin. Aberdonian Richie Ramsay tied for 54th place in the final standings. Finn Kalle Samooja made the third hole-in-one of the week with a pitching wedge from 139 yards on the 12th for the eighth ace of the season.